A wide variety of locomotives and multiple units have operated on Great Britain's railway network. This page lists every locomotive and multiple unit allocated a TOPS classification and all modern traction (e.g. diesel, electric, gas turbine, petrol) stock used on the mainline network since 1948 (i.e British Railways and post-privatisation). It excludes coaching stock, modern traction used prior to 1948 and steam locomotives used prior to 1968. Links to lists of these types can be found at the bottom of the page. British Locomotive and Multiple Unit Numbering and Classification explains in full the numbering and classification system used on this page. In brief, from 1968 British Rail classified its locomotives and multiple units using the TOPS system. Locomotives were given two-digit class numbers, and Multiple units three-digit numbers. Similar types were allocated blocks within the range, e.g. 01-69 for diesel locomotives, 70-79 for DC electric and electro-diesel locomotives, and 80-96 for AC electric and multi-voltage locomotives. The 1955 diesel locomotive classes are given in brackets where applicable. One-off 52 hp (39 kW) loco: 11104 1959 1 ? DY1 D1/1 1/15 11500-11502 D2950-D2952 ? 3 ? DY5 D1/3 1/16 11507-11508 D2957-D2958 ? ? ? DY11 D2/1 2/4A 11700-11707 D2700-D2707 ? ? ? * Second use of "class 21" designation. 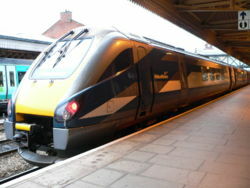 Class 41 (HST) ? 2 ? Class 43 (Warship) D22/2 1960-62 33 ? Gatwick Express Class 73 no. 73201 at Clapham Junction. Freightliner Class 86 nos. 86613 and 86610 at Ipswich. These were locomotives built and owned by private firms, but used by British Rail to test them. 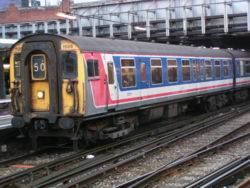 In the majority of British Railways First Generation DMUs the powertrain was supplied by British United Traction. Preserved BR Class 108 nos. 50980 and 52054, on the Severn Valley Railway. Chiltern Railways Class 121 "Bubble Car" no. 121020 at Bewdley. 'one' Class 170 no. 170202 at Cambridge. Southern Class 205 unit no. 205032 at London Bridge. These units had electric transmission (as opposed to mechanical or hydraulic). The Southern Region of British Rail, used single letter codes to classify their DEMU classes. 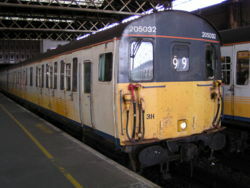 British Rail operated a wide variety of electric multiple units for use on electrified lines. AC units operated off 25 kV AC from overhead wires. Where clearances for the overhead wires on the Great Eastern and London, Tilbury & Southend routes were below standard, a reduced voltage of 6.25 kV AC was used. The Midland Railway units used 6.6 kV AC. Under the computer numbering, AC units (including mixed-voltage units that can also work off a DC supply) were given a class in the range 300-399. DC units operated off 650-850 V DC from a third rail on the Southern Region and North London, Merseyside and Tyneside networks. 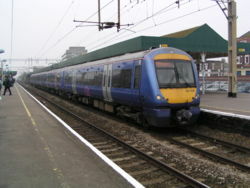 The Manchester-Bury line used 1200 V DC from a side-contact third rail. The Manchester South Junction & Altrincham and "Woodhead" and initially the Great Eastern and London , Tilbury & Southend routes used 1500 V DC from overhead wires. Under the computer numbering, DC units were given a class in the range 400-599. First Great Eastern Class 312 units nos. 312718 and 312721 at Kirby Cross. Silverlink Metro Class 313 no. 313114 arriving at Clapham Junction. c2c Class 357 no. 357036 at Southend Central. The Southern Railway and its successor, the Southern Region of British Rail, used three letter codes to classify their DC EMU fleets, as shown after the TOPS class numbers. South Eastern Trains Class 411 unit no. 1586 at London Victoria. Gatwick Express Class 489 unit no. 489110 at London Victoria. The 500 series classes were reserved for DC EMUs not from the Southern Region. This included the DC lines in North London, Merseyside and Greater Manchester. The DC electric network around Tyneside had been de-electrified by the time TOPS was introduced, and the stock withdrawn or transferred to the Southern Region. 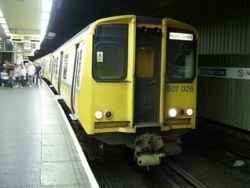 Merseyrail Class 507 unit no. 507026 at Liverpool Central. This was a one-off unit, withdrawn before the introduction of TOPS. 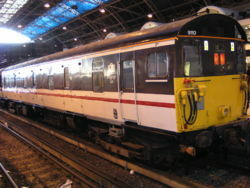 The 900 series classes were reserved for multiple units in departmental stock, most of which were converted from old passenger units. In broad terms, classes 930-935 were allocated to Southern Region multiple units (ex-200 and 400 series), 936 & 937 to other EMUs (ex-300 and 500 series) and 960 to other DMUs (ex-100 series). In recent years, this has been less rigidly adhered to. The original use for the Southern Region (SR) classes are included in brackets; these designations have been less rigidly applied in recent years. This page was last edited on 14 February 2007, at 02:35.